Recipe adapted from Brother Juniper's Bread Book. My husband worked at the Br. Juniper's bakery in HS so we've eaten a lot of these things. The basic idea is that taking a good filling and a good dough and bake them together, how can you go wrong? 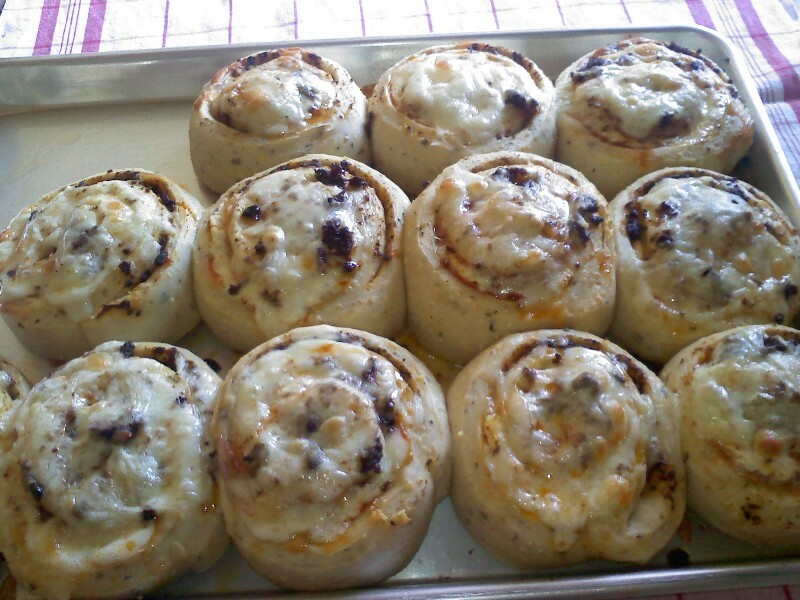 Think savory cinnamon roll, but use your imagination: you could use any dough and any number of fillings. The bakery used to make a veggie version on a roasted pepper bread and a meat version on an herb bread. Here I've adapted the meat version to use up what we happened to have in the fridge (some extra Kabanosa, which I've seen called a "Polish Slim-Jim"). I think the bakery used to use some kind of salami. Sausage would be good too. 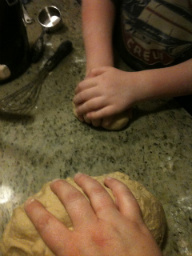 Mix all the dry, add water and mix until you've got something you can knead, then knead it for approx. 10 minutes. Let it rise for 1 1/2 hours. Roll it up and slice it into 1 inch thick slices. It'll spill, but no sweat: just dump anything that pours out on top. Let rise for 1 1/2 hours then bake for 1/2 an hour at 350. You also don't need to slice it before baking it. For parties at the bakery they would roll one up and bake it whole, then just slice it off as people wanted some. It was quite impressive. I find that the little ones are much easier to deal w/ though. Enjoy. Let me know if you try any other fillings. These are great for throwing in the freezer and then you can take them to work with you for lunch! They thaw out by lunch, and then 30 seconds in the microwave and it's mmmm..mmmm goodness. I have a feeling Amy and I will be giving this one a test run next week, d.
oooh I made these the other night and they were SO GOOD. I put in hot turkey sausage, a lot of cheese and broccoli. I think I overcooked them a little, and next time I need to cook them closer together, but they still turned out really good. Amy and I did make this Saturday afternoon. 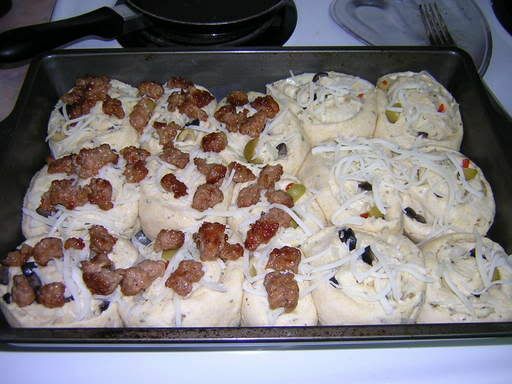 We used green, pimento-stuffed olives, black olives, onion, mozzarella, and Italian sausage. I added parmesan cheese into the dough, which is something I used to do making my pizzas. We also brushed about a tablespoon of olive oil over the dough before putting the toppings on it. So here's the attempt to get photos into the post. If it works like LJ, we ought to be good. 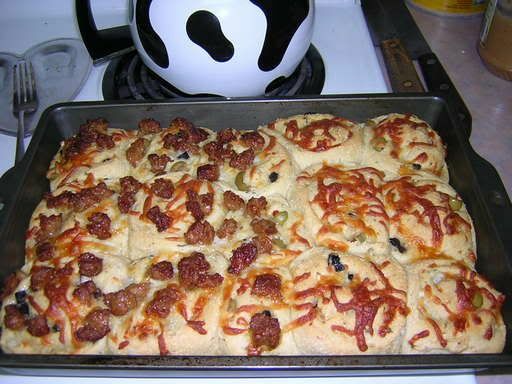 Thank you for posting your recipe and photos of those delcious looking Strombolini! 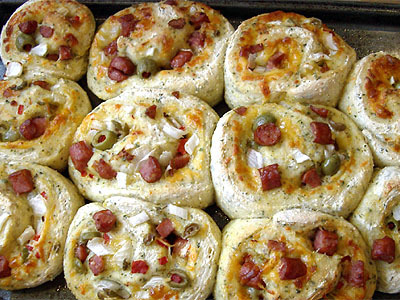 For many years now I wanted to find a "Pizza Roll" recipe similar to those made by a bakery in Greensboro (now defunct I think). Your recipe looks as close as I'm ever going to find. I can't wait to try these! Mmmh, looks so delicous! I just need to bake it soon! Divide dough into 2 pieces and roll out like you are making cinnamon rolls. Spread half of the tomato paste on each piece of the bread dough like you were spreading peanut butter on a sandwich and sprinkle it with garlic salt, Italian seasonings and Parmesan cheese, Mozzarella cheese, caramelized onions and bell peppers. I also cooked my mushrooms first. Rolled it up and baked it at 350° for 1 hour. 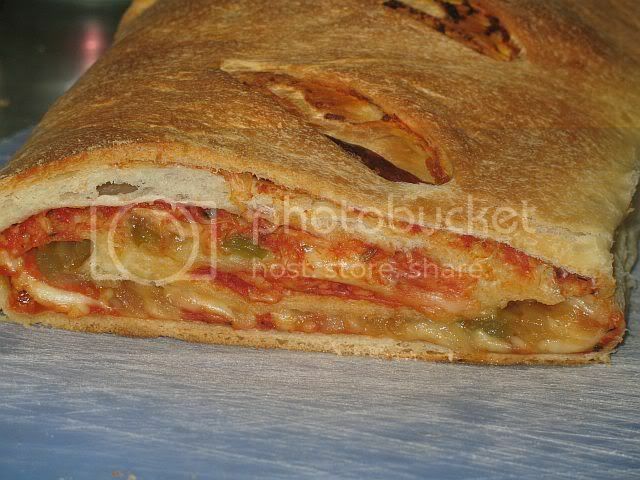 I've had individual stromboli before and thought it good, but all of these variations look yummy! Maybe if I'd known about the strombolini, I'd still be married... NOT! I've got pesto to smear on the bread before any other decorating, and a vivid imagination. The remark about the alfalfa sprouts put me ROFLMAO! I have the dough rising right now for this stromboli. The only variation I made was to add some Pasolivo, my favorite California olive oil, to the dough. The dough smells awesome. Now I am off to the store to find some fillings. I hope to post pictures when all is done. 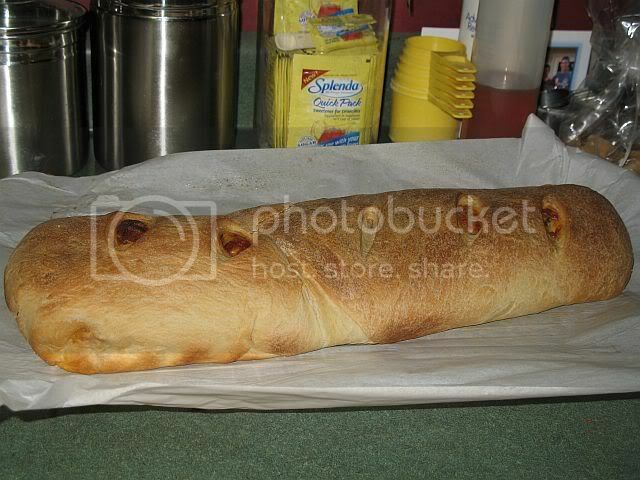 I chose to do a traditional-style stromboli, using pepperoni, ricotta cheese, a deli mix of provolone, mozzarella and american cheeses, and hickory smoked ham, as pictured. I also did a second batch, using figs, caramelized onions and bleu cheese blended with some ricotta. I forgot to take a picture of these when I took them out of the oven. I did alter the seasonings in the dough for these: forgoing the basil, garlic and parsley for finely ground fennel seed. The flavors of both of the stromboli were wonderful. Two batches made 24 pieces that were the base for an informal gathering of friends and family. There was nothing left to bring home at the end of the night. I must note that I will be spending time with my family in the Outer Banks in August, and we will be having our 1st Annual Stromboli Cookoff. Several members of the cookoff were present tonight, and have decided to give me the award ahead of time to avoid embarassment for everyone else : ). I might have to do a very simplified version of this for my boys. My aspie son loves cinnamon rolls and cheese pizza, this might be a way to add in some other things siowly, plus, what a great snack for kids! You could easily make these, divide them and freeze. They could take them out, thaw and put in the toaster oven to reheat. You could even make smaller, super mini rolls of a more bite size portion too... Hmm... wheels are turning! Thanks for posting about this. I love this site! First Sourdough rye - verdicts please?